Discovered 1702 by Gottfried Kirch. Globular cluster Messier 5 (M5, NGC 5904) was first seen by Gottfried Kirch and his wife Maria Margarethe on May 5, 1702, when they observed a comet, and described as a "nebulous star". Charles Messier found it independently on May 23, 1764, and described it as a round nebula which "doesn't contain any stars". William Herschel was the first to resolve this cluster into stars; he counted 200 of them with his 40-foot [FL] reflector in 1791, "although the middle is so compressed that it is impossible to distinguish the components." 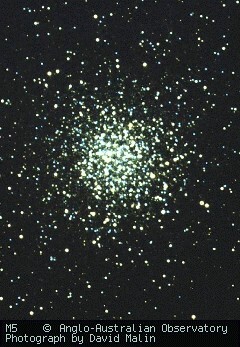 M5 shows a distinct ellipticity, elongated at position angle 50 degrees (position angles give the orientation of a feature in the celestial sphere; they are measured between North and the direction considered, in counterclockwise sense); it is thought to be one of the oldest globular clusters, with a computed age of 13 billion years. Its diameter is about 165 light years, making it one of the larger globular clusters. At its distance of 24,500 light years, this diameter is about 23 minutes of arc. Visually it appears somewhat smaller, about 10 or 12 arc minutes, and on typical phitigraphs, it can be traced to 17 arc minutes (corresponding to the inner 125 light-years of the cluster). Its tidal radius, beyond which member stars would be torn away by the Milky Way Galaxy's tidal gravitational forces, is 28.4 arc minutes, or 202 light years, so that the cluster gravitationally dominates a spherical volume of over 400 light years diameter. It has a compressed central core of 0.84' angular, or roughly 6 light years diameter, and its half-mass radius is estimated at 2.11', corresponding to a linear radius of 15 light years. Its overall spectral type was estimated as F7. M5 is receding from us at about 52 km/sec. M5 contains the considerably large number of 105 known variable stars. The first variables in this cluster were noted by A.A. Common in 1890. S.I. Bailey (1899) found 85 short-period variables in this cluster, of type RR Lyrae (or cluster variables); 97 of them were known in 1955, according to Kenneth Glyn Jones. One of the other variables is a dwarf nova, according to Cecilia Payne-Gaposhkin (she also mentions two more dwarf novae in the globulars M30 and NGC 6712). Our image of M5 was obtained (and is copyrighted) by David Malin of the Anglo Australian Observatory. More information on this image is available. Further informations and interesting details on M5 can be found Leos Ondra's article `Messier 5 and its Variables'. Thanks to Leos for allowing to include his article in this page ! It includes, among other interesting stuff, a Color-Magnitude Diagram of M5. To find M5 easily, first locate the nearby star 5 Serpentis. This may be made easy by finding the stars 109 and 110 Virginis (of mag 3.72, sp A0 V and mag 4.4, sp K0 III respectively) southwest of Arcturus, which point eastward to the small triangle of stars, 4, 5, and 6 Seprpentis. M5 is just 20' NW of 5 Serpentis. Under very good viewing conditions, M5 can just be glimpsed with the naked eye. 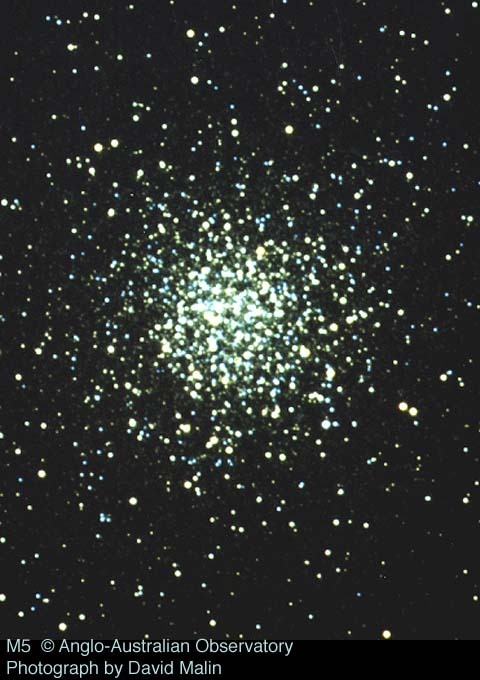 The globular cluster is easily visible as small fuzzy patch in good binoculars, and a fine round "nebula" in 3-inch telescopes, brighter toward the center. Starting with 4-inch, its brightest stars, of mag 12.2, can just be resolved; they form curved patterns extending from the central part which John Mallas found suggesting a spider; one of the "legs" extending far southward, the halo extending to a diameter of over 10'. Larger telescopes or photographs reveal a spectacular sight with thousands of stars, a few less populated gaps, and the halo extending to over 15' diameter. The bright nearby double star 5 Serpentis was also cataloged as Struve 1930, and consists of components A, 5 mag, pale yellow, and B, 10 mag, light grey; position angle 37 deg, distance 11" (as determined in 1923). This star is mentioned in Messier's description (but not its character as double). Also situated nearby, just about 40' south of the star 4 Serpentis mentioned above, is faint and distant globular cluster Palomar 5 of mag 11.8 and 6.9' diameter, about 75,000 light years away from us. To the west of M5 and up to 110 Virginis is a collection of faint distant galaxies including NGCs 5806, 5811, 5813, 5814, 5831, 5838, 5839, 5845, 5846, 5846A, 5848, 5850, 5854, 5864, 5865, 5869 and 5887, of brightnesses between mag 10.0 and 13.9, mostly requiring larger telescopes.